As you can see, I have traded in my skinny trousers for a wide set, and paired them with the chicest sweatshirt I have ever encountered. All I needed after that, was a bit of bling, and I was ready to take on the day in style. Way to rock all white! Sheer again and lovin it!!! you seriously know how to style girl. knockin’ me out. Can’t believe this is the first time I”m seeing this shirt either. You’re killin’ it! Loving the all white, great styling. can’t get enough of all white. those white pants are absolutely great! In a way I can`t believe this top is from Zara. Its too good. I mean, I usually do like Zara but to be honest there are times when I`m just left wondering will I find even one item I like currently in stores… but this… LOVE. and trousers too. amazing. White looks so good on you. 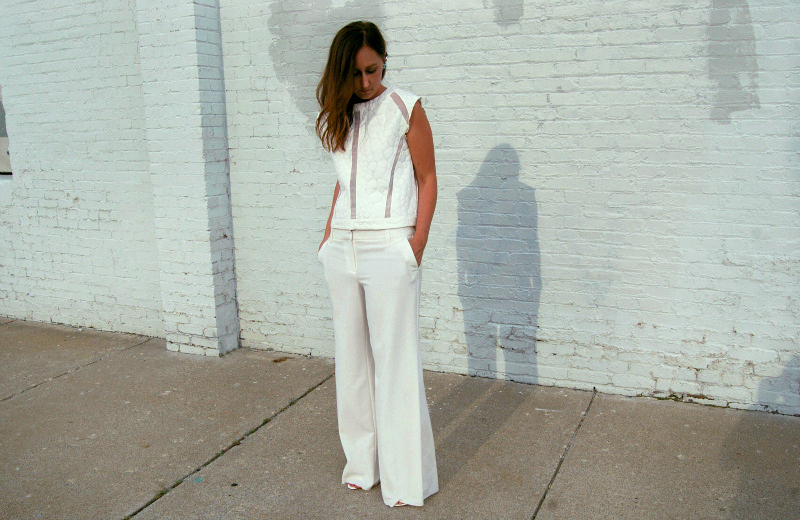 I wish I could look as good in white as you Miranda….I dont really have white stuff in my closet. And those wide legs are all I need to start building up a white look! bellissimo il top (: Reb, xoxo. OBSESSED with white on white, you look fantastic!!!!!!! No one does white quite like you! Love the wide leg pants! can’t go wrong with all white – you look amazing miranda! I think this is definitely a favorite..i LOVE it! beautiful look my lady 🙂 you are gorgeous! Love the all white look with the cool jewelry pieces! What a lovely outfit:) and your blog Is SO cute.